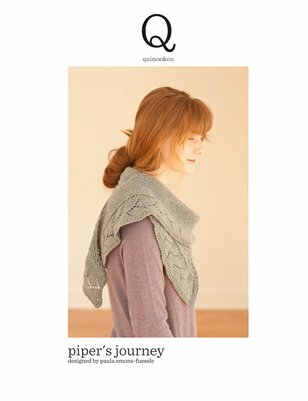 Chickadee is a little darling—soft, plump, springy, and eager to loop into intricate color patterns or delicate textures. Its three plies, spun from softest American wool, are twisted together firmly enough to be sturdy, yet gently enough to be soft and cushiony. 41 beautiful colors to choose from and at just a little over $7 per 181 yd/50g skeins…you will find Chickadee a great value for your sport weight knitting. The anniversary of the show always sneaks up on me and I nearly forgot it last week until someone asked me how long I had been podcasting. Thank you so much for your notes of congratulations and support. Question on Blog from Jane. Jane, yes, vinegar is great for setting dye. It may not prevent bleeding of dye entirely but should help. Vinegar also helps remove soap residue in the final rinse. Maine retreat November 10-14 near Portland Maine. Episode 136 has links and information. SSK! 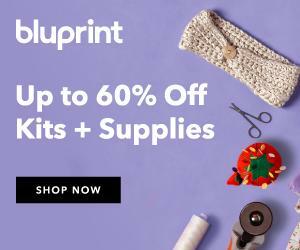 Super Summer Knit Together hosted by The Knit Girllls! No show next week! 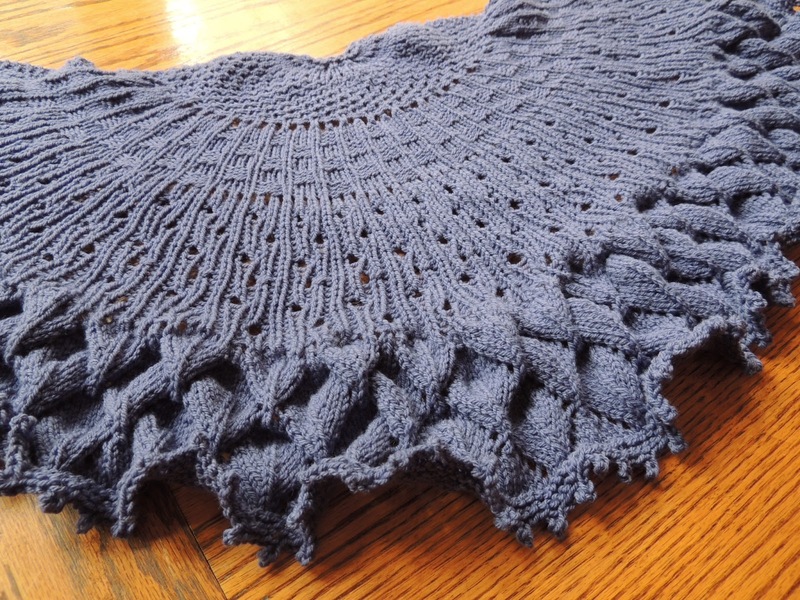 Wave 2 KAL July 12 starts July 12. 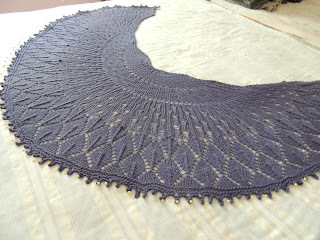 Lullaby Rain pinned out and blocked. This morning it was quite cool when I went out and the porch is open and comfortable. As I sit here with my lunch I hear the Red Eyed Vireo repeating, “Here I am, where are you?” from the woods. Three turkey hens have been hanging out with me today, snacking below the platform feeder and sitting in the sun. We saw a doe and her fawn at breakfast. They didn’t stay long but ran just a little and crossed over the gulley where we throw all our branches and leaves. We had another encounter with Mr. Barred Owl. In this video you will see him/her eating prey. The video is not terribly graphic. Formerly a free pattern now $5.00 and worth it! I used Dream in Color Smooshy in Shiny Moss. A lot left over from Aestlight by Gudrun Johnston. My Aestlight is here. 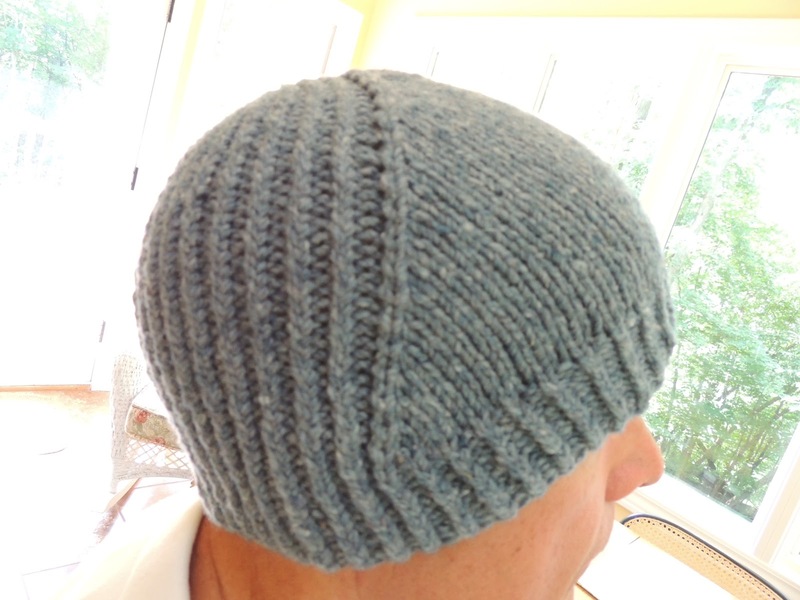 NOTE: Looks VERY small when it comes off the needles. It is lace. "You live in Oregon. You can wear anything on your head and get away with it." Our Oregon boy lookin' good! I made small size because project notes say tends to run large and it did. I may add the button to calm down the slouchiness. Enjoyable knit with super easy texture patterns. 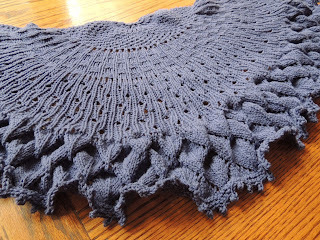 I used Imperial Yarn Columbia made in Oregon in color Canyon Shadow. Have my own souvenir coaster now. 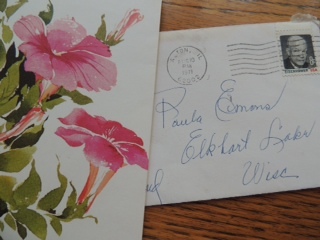 Last week I share a letter that was written to me by my grandmother in the early 70’s. She asked me in that letter whether I wanted another poncho. Many of you said to SAVE the Letters! I am finding that I simply have to keep some of these. 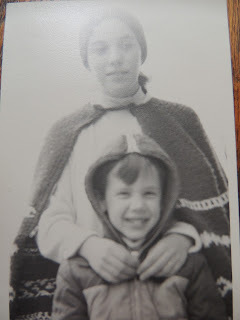 I will post a photo of me in the original poncho and my grandmother in one of her own ponchos and her original berets. She loved colorwork so most everything she did had color patterning. I always wish I had a sunroom looking out at woods...I don't and probably won't as long as we're in the Dallas area. I am living vicariously during your podcast and your nature notes. I'm sure I'd spend most of every day out there. The owl video was wonderful!! Thank you. Have a ball at SSK. I know we'll all be eager to hear all about it. 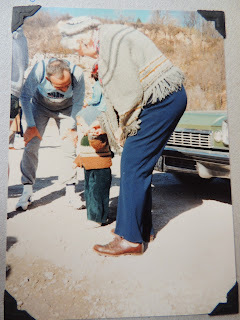 Knew you'd post the poncho pictures...and I love them. What a wonderful knitters you grew up with. 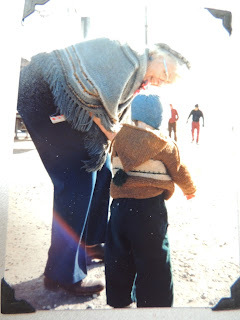 Your grandmother would love your podcast and Pipeliner knitting community. The owl video was a treat. Windschief is my son's favorite hat. He's on his third. Don't worry about them seeming small. They stretch and that is what ends their life. Is there is any way to revive a stretched out hat? Blocking doesn't work. Happy Podiversary. 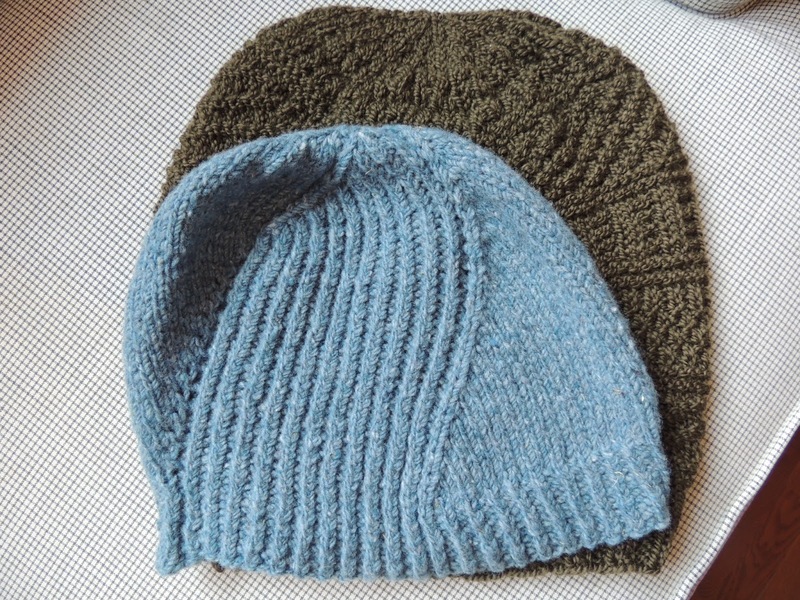 I had a lovely afternoon knitting and listening to this podcast and then a couple of the EZ ones from last year. My registration is going in the mail in the morning. I loved the episode and the pictures are wonderful!